Rationale: The benzodioxane, S15535, possesses low intrinsic activity and marked selectivity at 5-HT1A receptors, hippocampal populations of which are implicated in anxious states. Objective: Herein, we examined its potential anxiolytic actions in relation to its influence upon extracellular levels of 5-HT in the dorsal hippocampus of freely-moving rats. 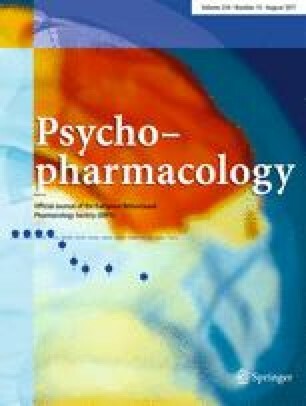 Its effects were compared with those of other anxiolytic agents: the 5-HT1A agonists, buspirone and 8-hydroxy-2-(di-n-propylamino)-tetralin HBr (8-OH-DPAT), the 5-HT2C antagonist, SB206,553 and the benzodiazepine, diazepam. Methods: Potential anxiolytic actions were evaluated in the Vogel conflict paradigm (increase in punished responses) and the social interaction (SI) test (increase in active SI) in rats. Extracellular levels of 5-HT were determined by microdialysis. Results: In analogy to diazepam, S15535 increased punished responses in the Vogel test. This action was dose dependently expressed over a broad (16-fold) dose range. Buspirone and 8-OH-DPAT were likewise active, but yielded highly biphasic dose–response curves. SB206,553 was dose dependently active in this model. In the SI test, S15535 similarly mimicked the anxiolytic-like effect of diazepam and was active over a broad dose range. Buspirone and 8-OH-DPAT again showed biphasic dose–response curves, as did SB206,553. In both the Vogel and SI tests, the anxiolytic-like effects of S15535 were abolished by the selective 5-HT1A receptor antagonist, WAY100,635, which was inactive alone. S15535 exerted its anxiolytic-like effects with a more pronounced separation to motor-disruptive doses than the other drugs. Finally, S15535 suppressed dialysate levels of 5-HT in the dorsal hippocampus, an action abolished by WAY100,635. Buspirone, 8-OH-DPAT and diazepam, but not SB206,553, also reduced 5-HT levels. Conclusion: Likely reflecting its distinctive ability to selectively and preferentially activate pre- versus postsynaptic 5-HT1A receptors, S15535 suppresses hippocampal 5-HT release and displays marked anxiolytic-like effects over a broad dose range in the relative absence of motor perturbation.